This section presents security recommendations to apply in the Bizagi Work portal regarding aspects which are relevant to Bizagi's configuration (application hardening). To carry out the recommendations presented below, you should have already followed what is described in Basic recommendations. The following recommendations apply when Bizagi runs on a .NET platform, independently from the Web server IIS version on which it runs. This section describes the recommended configuration for an IIS Web server version 7.5, and such hardening is carried out according to the IIS capabilities. These apply to your testing or staging environment as well. 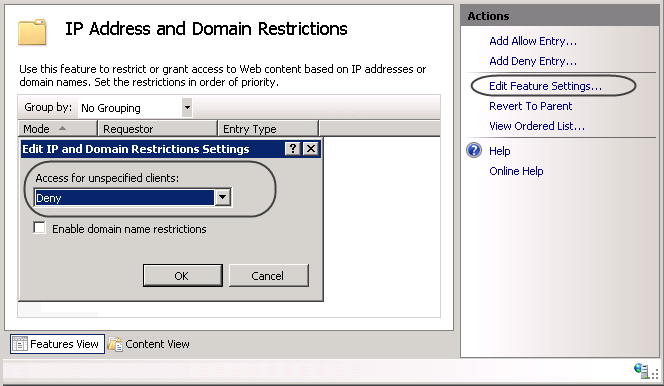 For the next steps, make sure you have installed the IIS components World Wide Services -> Security -> Basic Authentication, and IP and Domain restrictions (when installing the IIS). Include the following element in the web.config file of your Work portal (by default, located at C:\Bizagi\Projects\[your_project]\WebApplication\) to encrypt cookies. In the same web.config configuration file in your Work portal, edit the definition for <pages>, so that the ViewState attribute always uses encryption. This action secures the information dictionary as described at https://msdn.microsoft.com/en-us/library/ms178199(v=vs.85).aspx. By default Bizagi includes its built-in web services in the .\WebApplication\WebServices\ folder (inside the default path at C:\Bizagi\Projects\[your_project]\). There are two types of web services published at this location: business-oriented web services which make up Bizagi's API, and web services which provide functionality used internally by Bizagi. We strongly recommend that you provide an additional layer of security to restrict access to these web services, and to use separate folders for the two types of web services to implement different security measures for each. You may even leave as inaccessible the business-oriented web services if your project will not be using them. Even though you should use HTTPS configuration, you should explicitly configure the web services' folder and access with the measures described in the table below. Define an IP whitelist which only includes the local Bizagi server's IP, as an authorized server allowed to access these web services.. 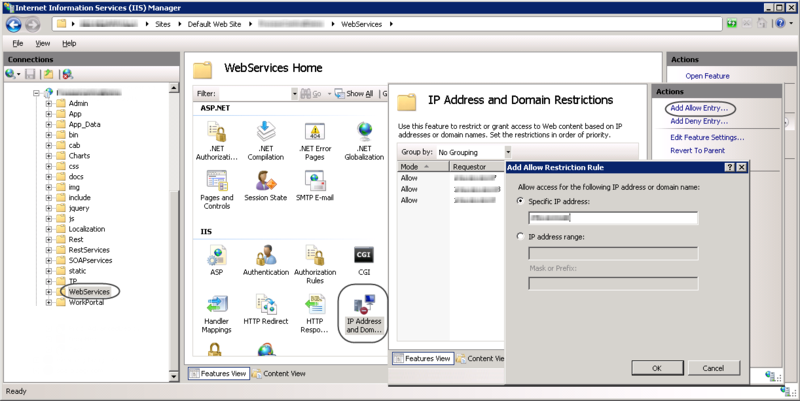 Define an IP whitelist which only includes the identified and authorized external servers (or an IP range), as those allowed to invoke web services in Bizagi. Configure basic authentication to access these web services. This way, external application would need to authenticate prior to invoking web services in Bizagi. Separate those internal services from those which provide integration capabilities. Internal Web services are: Cache.asmx, WFEQuery.asmx and WFAsynch.asmx. 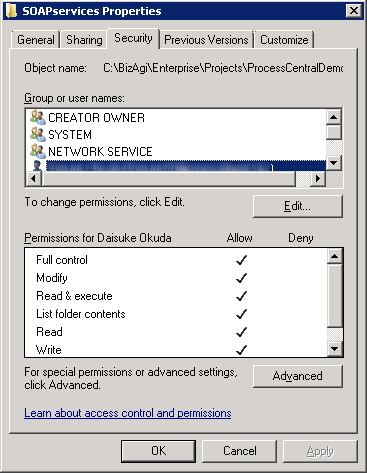 To do this, create a new folder in the Web application's structure provided in Bizagi's Work portal (by default at C:\Bizagi\Projects\[your_project]\WebApplication\). Once you are done, verify that only Cache.asmx, WFEQuery.asmx and WFAsynch.asmx, are still located at the .\WebApplication\WebServices\ folder. 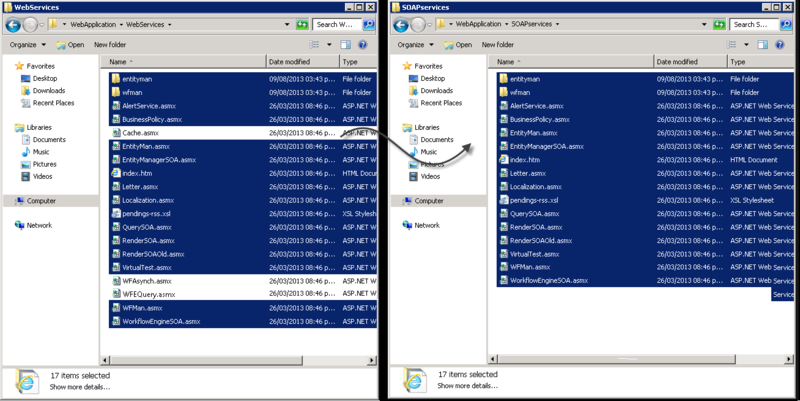 Configure the IIS, so the .\WebApplication\SOAPservices\ folder containing Bizagi's Web services which promote application integration (i.e, WorkflowEngineSOA, EntityManagerSOA, QuerySOA, RenderSOA), uses basic authentication. Through this setting, external applications invoking these services will need to specify basic authentication credentials (user, password). Make sure that users allowed to access this content are granted privileges to its physical path (according to your registered domain). You can even leave as inaccessible the business-oriented web services, or delete them, if your project will not use them. 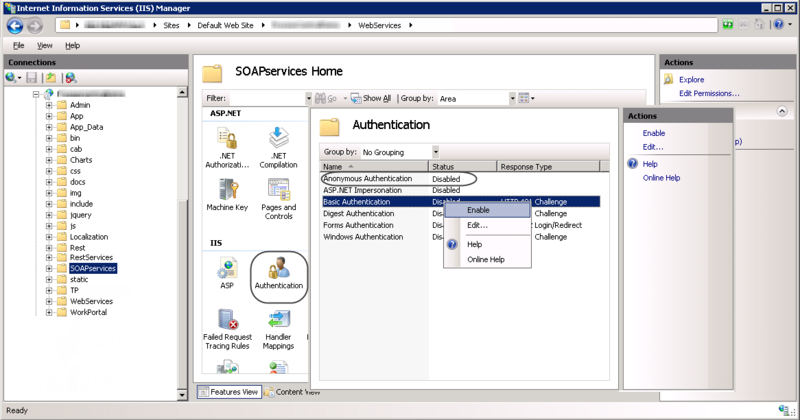 When setting basic authentication for web service access, make sure that your other applications invoking such services will be able to authenticate. oThe .\WebApplication\WebServices\ folder containing Cache.asmx, WFEQuery.asmx and WFAsynch.asmx, is accessible only by authorized IP addresses (in this specific case, only by the local server). oThe .\WebApplication\SOAPservices\ folder containing business-oriented web services is accessible only by authorized IP addresses or an IP range of addresses (in this specific case, those IPs belonging to the external application invoking Bizagi). 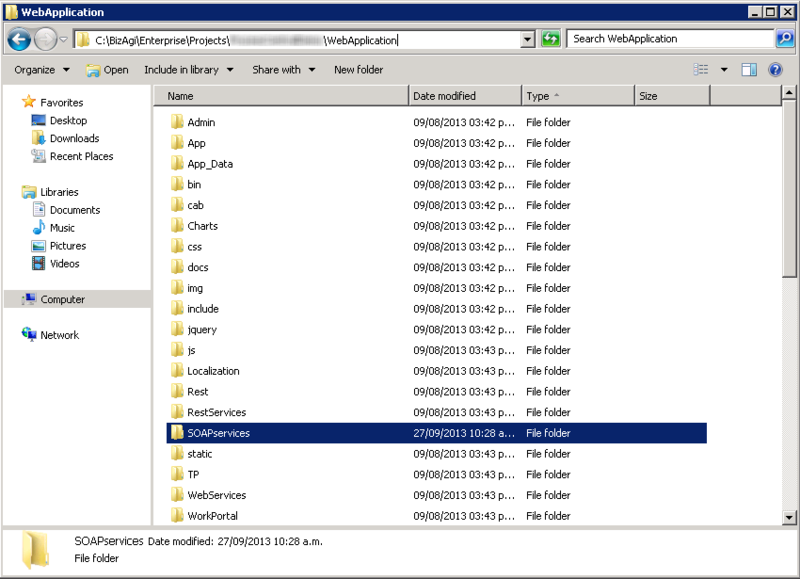 We recommend that you delete the folders whose use is oriented to the development environment. This action is to avoid leakage of code information (a vulnerability known as Source code leakage). •Readme.txt located at the desktop templates (by default at C:\Bizagi\Projects\[your_project]\WebApplication\jquery\overrides\templates\desktop\Readme.txt). •Login.aspx located at the Admin folder (by default at C:\Bizagi\Projects\[your_project]\WebApplication\Admin\Login.aspx). •Plan, coordinate and test appropriately all upgrades. •Rely on your different environments (development, testing, pre-production when applicable, and production). •Take proper contingency measures (e.g. backups) before starting the update. 1. If upgrading through the Bizagi Management Console, reconfigure and verify that such measures are still applied after the upgrade (we recommend backing up customizations before starting the upgrade). An upgrade done through the Management Console will not check whether you have done modifications to the original files and file structure. 2. 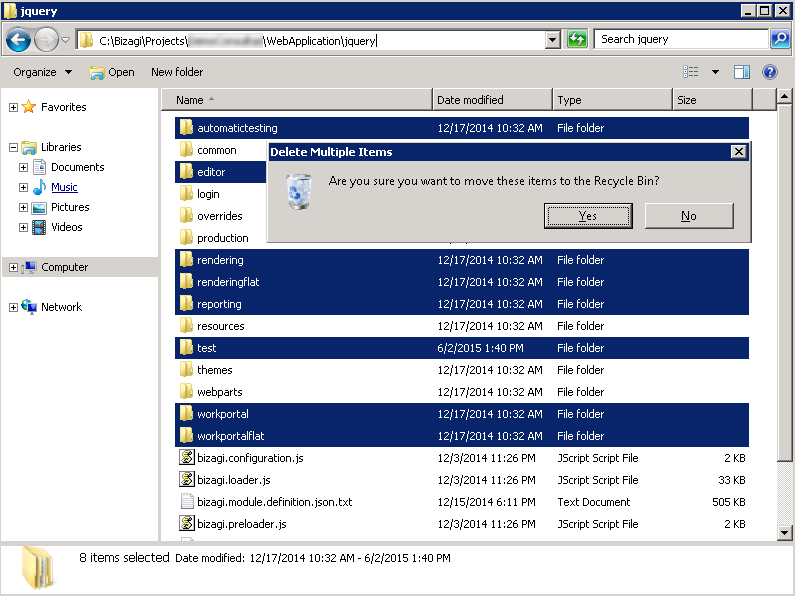 You may upgrade through a manual procedure, without using the Bizagi Management Console. For highly critical security issues, Bizagi may issue hot fixes and recommend that you apply them without waiting for a newer version. To evaluate or consider additional application hardening aspects, refer to Advanced recommendations.